Pawleys Island Hammock began life back in 1889 when riverboat captain Joshua John "Cap'n Josh" Ward decided to create for himself a cool n' comfy cotton-rope suspended bed to catch his zzz's in during nights out on the water (hammocks are commonly used on river boats the world over). Almost 125 years later and Pawleys Island Hammocks is a manufacturer and global supplier of comfortable one-person, double and family-sized hanging beds, designed for relaxing at home rather than travel. This means a Pawleys hammock is well worth considering if you fancy chilling out on the deck, patio, by the pool or in your yard. 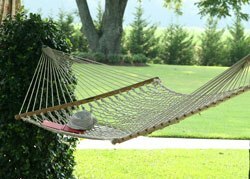 A Pawleys Island hammock is designed for backyard slumbering. For this reason the company places so-called 'spreader bars' at each end of its beds. Made from beautifully varnished white oak and using weather-proof hanging chains and 'O rings', these spreader bars literally spread each end of the hammock material. This flattens the bed, making the experience of lying down much more mattress-like (i.e. flat, to catch more of what breeze there is, rather than being cocooned in your hammock as is usually the case with 'mayan' and camping hammocks). Pawleys Island hammocks do not come with stands supplied. (This is not always obvious from the pictures on its official website). These stands must be bought separately (see below). 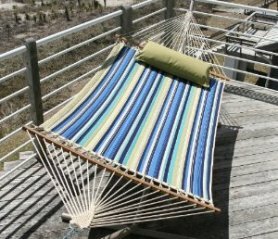 One defining characteristic of a Pawleys hammock is just how much rope it employs. The company's hammock bodies average 10-15% heavier than their closest competitors - 50% heavier than some in fact! That's because Pawleys Island make the rope themselves. Their high-quality yarns are machine-wound into three separate 'plies'. These are then precision-twisted and balanced to a strength that more than meets the standards of the U.S. military for example. This strong three-ply rope is available in traditional cotton or soft-spun white polyester (the latter being the more durable of the two). The company also offers hammocks made from a third rope material; its next-generation synthetic DuraCord. This premium-quality material keeps its color the longest of the three, because the color is added at the fiber-making stage. It is both stain-resistant, super quick-drying and won't rot either (as cotton and even polyester can do if left outside or in a damp place). With a Pawleys Island bed you get only high-quality wood components. The company uses Southern hardwood for its hammock spreader bars, hammock swings and rocker chairs. A special countersink drill is used to make the rope holes in Pawleys' hammock spreaders to reduce wear on the ropes, and all of the company's wooden components are hand-dipped several times in boat-grade varnish for full protection against the elements and a nice warm honey glow. Pawleys Island splits its hammock range into two distinct categories: rope hammocks (i.e. with holes in the bed for air to get through) and denser, more luxurious 'fabric' hammocks. Below we outline the company's key models in each category – including product details, pricing advice and a fully-researched guide to the feedback that owners give about these beds. This is it - the original Pawleys Island hammock as first envisioned by John Ward back in the day. Made from almost a thousand feet (305 meters) of super-strong 3-ply cotton rope, this luxurious breezy bed is hand-woven using a lattice design. And because it is a large model - at 55 inches (140cm) across and 82 inches (208cm) long - it is wide enough to fit two lazy-rocking friends weighing up to 450lbs/204kg. If you have the trees handy, this large bed includes a pair of the company's sturdy Zinc-plated tree hooks (or you could go for its more tree-friendly strap accessories or equivalents such as ENO's SlapStraps). Alternatively, you can check out one of the Pawley frames mentioned further down this page. Generally speaking the vast majority of people who own this classic Pawley's Island hammock are very happy with their purchase. They report that it is solid and sturdy, very comfortable and holds up well through all kinds of weather (note - we do not recommend leaving cotton hammocks hung outside in damp weather as cotton can rot over time). On the negative side, there is not much to mention but there is a little. Occasional users claim that their beds' ropes unwound from the frames quickly. However these are small minority of owners and such defects are covered by the company's 90-day money back guarantee and year-long warranty. 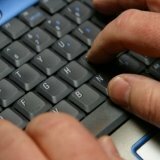 Another couple of Amazon.com buyers claimed to have been sent packages that had "obviously been sent to someone else and returned". If in doubt, be sure to check the feedback on the retailer you buy from (in addition to Amazon itself, many third-party retailers also sell through Amazon.com - it's not clear in their reviews who the users above bought from). 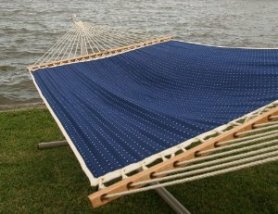 Couples or larger individuals looking for a large, comfortable, non-sweaty hanging bed for their garden, deck or yard. 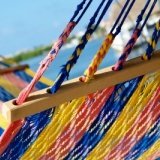 Where to buy it: find this large rope hammock on Amazon here. You can also buy this bed from Pawleys Island direct, eBay, Home Depot and more. If you like the idea of the comfy double hammock above, but you're worried that even that might not be big enough when the kids or dogs also jump in, then this extra-large Presidential version could be the Pawleys bed for you. An extra 10 inches (25cm) wider than the large bed above, and with the same impressive weight limit of 450 pounds/204kg, this bed should support everything and everyone you can throw at it. Described by its manufacturer as the "Cadillac" of its cotton rope hammocks, the Presidential really makes the most of the strength of its zinc-plated hanging accessories (this is where most of the stress is placed when laying in a hammock). Of course its main material is also up to Pawleys' usual strength, as this is again seriously sturdy '3-ply' cotton webbing. Buyers generally love this huge hanging bed. It is not difficult to find owners talking about how they have owned, used and loved their Pawleys Presidential for many years, and they report that this particular model is just as "well made" and "easy to assemble" as you would hope. It's worth noting, says one buyer, that you will probably need to enlist a friend's help to set this hammock up. On the down side, one customer complained that the hardware broke when testing it with her family. Our tip: it is able to support 450lbs, so this bed should easily support most young families. However, if you and your partner are heavier than the norm and/or have older (so heavier) kids, it's worth considering this bed's 450lb maximum carefully before buying. You can also buy this bed from Pawleys Island direct, eBay, and more. Another gloriously seductive bright white bed, the difference between this large two-person hammock and the first mentioned above is its rope material; this bed's rope is made from polyester instead of cotton. This means more durability, as polyester is significantly more weather-, moisture- and therefore rot-proof than its cotton counterpart. The rope used for this bed is again hand-woven and spun in super sturdy three-ply style. Size-wise and in terms of how much weight it can support, this polyester hammock offers up exactly the same stats as the cotton version above: 55 inches (140cm) wide, 82 inches (208cm) long, and able to support people weighing up to a total of 450lbs or 204kg with ease. It comes supplied with premium white-oak spreader bars (to flatten your lay) and hanging hardware including two Zinc-plated tree hooks. This bed is well appreciated for its comfort and the durability that polyester offers. Described as way better than cheap foreign versions of the same, it is widely seen as a quality buy. Busy people who just want to hang it up and chill - rather than having the hassle of taking it down when not in use (as we recommend for cotton beds). Where to buy it: find this polyester bed here. 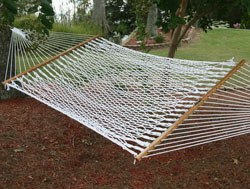 If you don't like cotton's tendency to rot and you want the very best quality garden bed on the market, this high-end DuraCord hammock is the product for you. Featuring top-of-the-line rope, this sturdiest of hammocks is designed with toughness first and foremost in mind, but it is still perfectly soft enough under you to be comfortable as normal cotton. This bed is the same single and two-person friendly size as the other rope hammocks above and supports the same maximum weight of 450lbs/204kg. The vast majority of customers rave about this bed's mix of comfort and superb long-term durability. One user reported they bought it, hung it out and left it out there in all kinds of weather for a whole six months, yet even after this time it looked like it had just been unwrapped. That said, users still sensibly recommend taking it in for the winter (after all, why take any chances when you're spending a fair chunk of cash on such a premium-level product?). On the down side, one user said the rope disintegrated after just a year of use. Others just wish its price was a little cheaper. 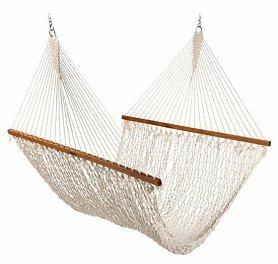 Any person or couple looking for a relaxing garden hammock that they won't need to worry about looking after. Where to buy it: find this DuraCord bed here or try Pawleys Island direct, eBay or Target. Perfect for damp conditions like by the swimming pool, on or near the beach, or in stickier climates, this Pawleys Island quick-drying bed is made from a single layer of non-absorbent all-weather 'Sunbrella' fabric. This is rot, mold, fade and stain resistant, but still manages to be as comfily soft as cotton. As usual this bed features Pawleys' lovely white-oak spreader bars, finished in honey-gold varnish, and its hanging power comes from those sturdy zinc-plated tree hooks. This bed is 55 inches (140cm) wide, 82 inches (208cm) long and supports up to 450lbs (204kg). It is also available in three color styles: Bessemer (brown earthy tones with a floral motif), Dupione Palm (a solid green), or Portland Dots (strong navy blue with grid lines of small white dots - shown right). Pawleys' fabric beds are reviewed less online than the company's rope beds, but the feedback we did find on this bed was 100% positive. Owners claim this bed is beautiful and comfortable. Buyers who want to soak up some rays in comfort, particularly by the pool or in more humid climates (or maybe they just don't like the feel of 'holey' rope on their skin and prefer a solid material). Where to buy it: find it here. You can also buy this bed from Pawleys Island direct and eBay. Offering a greater level of cushioned comfort, Pawleys' quilted fabric hammock features two sheets of cotton-soft all-weather fabric with a luxurious center of polyester filling. Aesthetic-wise, this two-person bed is all about the stripes, which run vertically from the head end to the toe. Three color themes are available: nautical cream n' blue (shown right), a red n' green garden theme, or the creamy pastel shades of so-called 'Regency Sand'. This bed is super study (thanks to its use of components called 'rolled-rim' grommets to attach the hanging ropes rather than traditional but weaker telescopic versions) and features the same dimensions and weight capacity as the quick-dryers above. This hammock is ultra comfortable - buyers just love it. Most people seem to buy a separate hammock stand and just hook this baby up to relax. Our research didn't uncover any negative customer comments about this bed. Folks who like to relax - alone or with a friend - in well-padded luxurious comfort. You can also buy this bed from Pawleys Island direct, eBay, WalMart and more. If you fancy one of the Pawleys Island hammocks here but don't have trees the right distance apart (approx. 2 feet wider than the full length of the hammock, so for most Pawleys this means a distance of 9 feet total), then a standalone hammock stand is the answer. This approach also allows you to move your bed around your yard during the day in order to catch, or avoid, every last one the sun's warming rays. 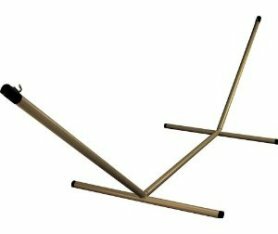 Pawleys' hammock stand is made from sturdy steel which is powder coated to make it fully rust and weather-proof. It uses a 'tri-beam' design and is built firmly with Pawleys Island hammocks in mind (however it should hold most other similarly sized garden hammocks too). Best of all, this stand doesn't require any tools to set it up - thanks to its spring-pin assembly you just slot it together and it boings into place! (See this helpful YouTube video.) All you need it a little flat ground and you're ready to chill. 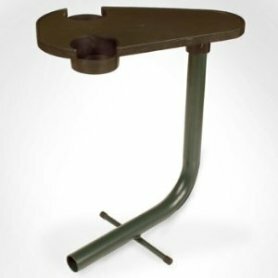 The stand is available in four different color finishes to help you match it to the rest of your existing garden or deck furniture. These are: forest green, silvery 'taupe', standard black or bronze (shown). The stand's base dimensions measure 4 feet (121cm) by 6 feet (183cm). Customers widely praise the strength and easy installation of this stand. They reckon it offers great quality for its price and they like the way its color options held it blend into its surroundings. The only downside we read about was the packaging the stand arrives in, which is not amazingly durable and can, on occasion, come apart a little during shipping. Buyers who do not have the necessary trees, poles or buildings to hang their Pawleys Island hammock from. Or those who like the idea of being able to move their bed around their outside space (a Pawleys stand wheel set is also available). Where to buy it: it is available on Amazon here. You can also buy this stand from Pawleys Island direct and on eBay. And finally, an ingenious Pawleys Island creation - a little 'bedside' table designed specifically for slumbering hammock owners. Made specifically to sit alongside the company's steel hammock stands (see above), this table is easily installed into one leg of the Pawleys Island steel stand (its base slots into one of the stand's feet). The result? Handy arm's-reach access to your book, newspaper, Kindle and/or drinks (the table's top actually includes two drink holders). It is finished using the same attractive powder coating as the company's hammock stand (though in black only), and it even swivels, allowing you to drag it closer whenever the need to sup strikes. Ingenious. Owners like the idea and design of this table. However they do mention two things: one claimed that moving the hammock stand around with the table attached was tricky, while another reported that the table wobbles a little if you have a large book and big drinks on there. Probably best recommended for light static use then. Pawleys Hammock owners who know where they want to relax (and stay there) and who truly value arm's reach convenience. Expect to pay: around US $70. You can also grab this table from Pawleys Island direct and it is often sold on eBay. Even a hammock rocking kit! Do you already own one of the beds above? Tell our readers all about it! Common misspellings through which you may have found this page include: pawley island hammock, pawley hammock and pawley s island hammocks. Copyright (c) Matt Wade 2010-2011. All rights reserved.